I went shopping yesterday and picked up some great bargains in the sales and here are a few pictures for you. 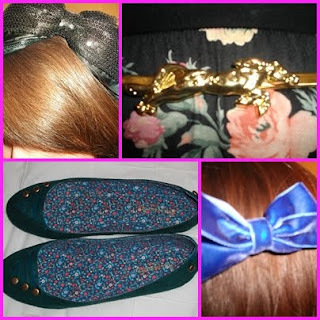 Hairband and blue bow clip are both from H&M, shoes are from accessorize, the belt was only £5 from Dorothy Perkins and my fave buy of the day. 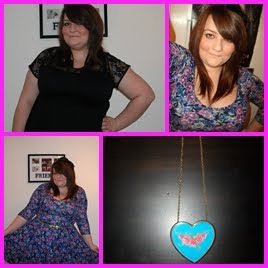 The floral dress is from Dorothy Perkins, the black dress is a New Look number and the cute Cath Kidston-eqsue necklace is from Accessorize. The sales at the moment are a good time to pick up plain wardrobe staples and there are a few pieces out there which will carry on through into the new season. Some great new items in New Look at the moment like this skater dress which I have in black, goes with everything and I wear it to work with flats, tights and a cardi or out at night with some shoe boots and a denim shirt. New Look really is a great shop, everything goes up to a size 18 and the inspire range goes up to a size 26. Pick up a copy of this weeks LOOK magazine for a 20% off New Look voucher.